This article will go into detail the whole of Topic 5, Particles in Action which includes absolute zero, Kelvin scale, electron gun, cathode-ray oscilloscopes, fundamental particles, Beta + or -, quarks, Alpha decay, beta decay, neutrons, protons, electrons and positrons, nuclear fission and fusion, creation and annihilation, radiation. Phew, that was a lot and it is a lot. However, you are more than welcome to skip to the parts most relevant to you. Absolute zero is the lowest possible temperature, so it is a sensible place to start a scale of temperature measurement. This means at this temperature, every particle ceases and stops vibrating. 1 Kelvin = 1 degrees Celsius. This is great for working between degrees and Celsius. Let’s take an example: work out what 37 degrees Celsius is in Kelvin. Well because 0 degrees Celsius is 273 Kelvin, all we have to do is add 37 onto 273 to get the temperature of 37 degrees Celsius in Kelvin, which is 310 Kelvin. Same if it’s the other way round. To transfer Kelvin to Celsius, just subtract 273 and you have your temperature in degrees Celsius. 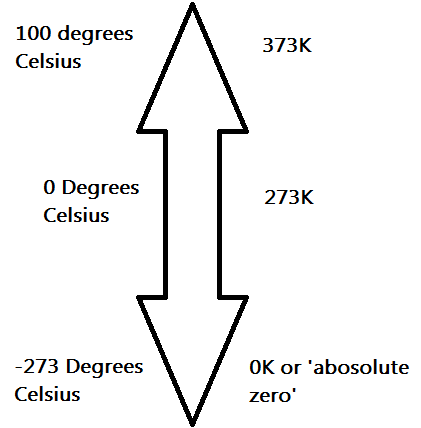 So, the important things to remember is that absolute zero is 0K = -273 degrees Celsius and 273K = 0 degrees Celsius. Electrons are boiled from the surface of a hot tungsten filament and then accelerated by a high voltage (5000V). The beam of electrons hits a phosphor screen and makes it glow. This is the way CRT (cathode ray tubes), CRO (cathode ray oscilloscope) and old TVs work. Fundamental particles are not made up of other particles. Electrons and positrons are fundamental particles whereas protons and neutrons are not as they are made of even smaller particles called quarks (scroll down to find more about quarks). The behaviour of particles can be investigated by accelerating them at extremely high speeds and then colliding them. This is where the particles are accelerated and collide. A particle accelerator uses electric fields or magnetic fields, or both, to accelerate charged particles. One type of particle accelerator is the linear accelerator which is straight and can be as long as 3 kilometres. Others are circular which has the advantage that the particles can go round many times continuously accelerating where the linear can only accelerate the particles once. The detectors that record the particles in collisions are as important as the accelerators themselves. In the 1950s and 60s, particle accelerators were discovering new particles which were named ‘quarks’. These are smaller particles that are found in protons and neutrons that have a charge of -1/3 or +2/3. If you add up the charges of quarks in a neutron and proton, you will find it agrees with physics as neutron has a charge of 0 while the proton has a charge of +1. You can easily remember what particles have what quarks as the proton will need more ‘up’ quarks to gain a positive charge while neutrons will need ‘down’ quarks to balance the ‘up’ quark which has a charge of +2/3. Beta decay of both sorts (+ and -) causes changes in neutron and proton numbers in the nucleus. Beta decay can be described in terms of changes to quarks in the nucleus. 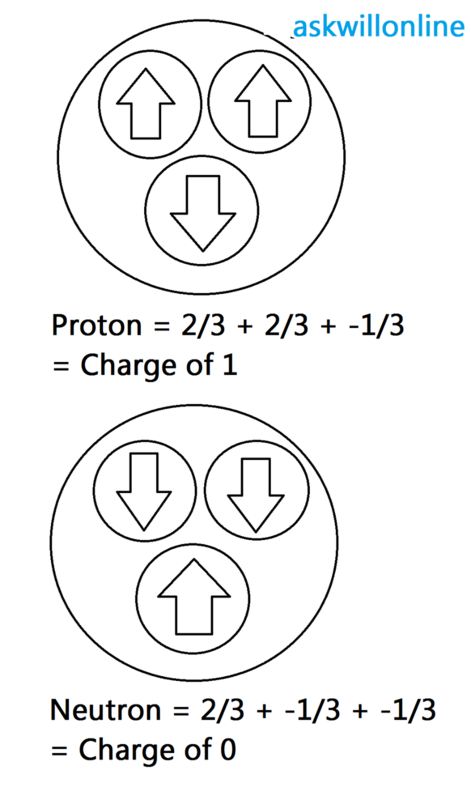 β- changes a neutron into a proton as two ‘down’ and one ‘up’ quark becomes two ‘up’ and one ‘down’ quark. This means that one ‘down’ quark has changed into an ‘up’ quark. β+ decay changes a proton to a neutron as two ‘up’ and one ‘down’ quark becomes two ‘down’ and one ‘up’ quark. This means that one ‘up’ quark has changed into a ‘down’ quark. This also means neutrons have a larger mass than protons. The difference in mass is one reason why β- decay is more common than β+ decay. It is easier to make a proton out of a neutron than the other way round. It is possible to make a neutron out of a proton in the nucleus because mass and energy are really the same thing (E=mc squared) and energy in the nucleus can be changed into mass. A proton on its own will not decay to release a positron, but a neutron on its own can decay to release and electron. The half-life of free neutron decay is about 10 minutes. So the fundamental particles in normal matter are electrons and the two types of quarks: ‘up’ (+2/3) and ‘down’ (-1/3). Normal matter refers to atoms made up of protons, neutrons and electrons. 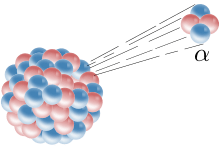 Alpha decay is the radioactive decay of an atomic nucleus is accompanied by the emission of an alpha particle (also a fundamental particle but not part of normal matter). Alpha decay changes the proton and mass number forming a new element forming a new isotope. The number of protons decrease changing the atomic number. Because alpha particles have a charge of +2, there forward accelerated energy is stopped after a few centimetres of air because of it’s attraction to other particles. Usually, the only particles that emit alpha particles are the ones that are quite heavy and have an unhealthy amount of protons such as Radium. Beta Decay is a type of radioactive decay in which emits an electron/positron. 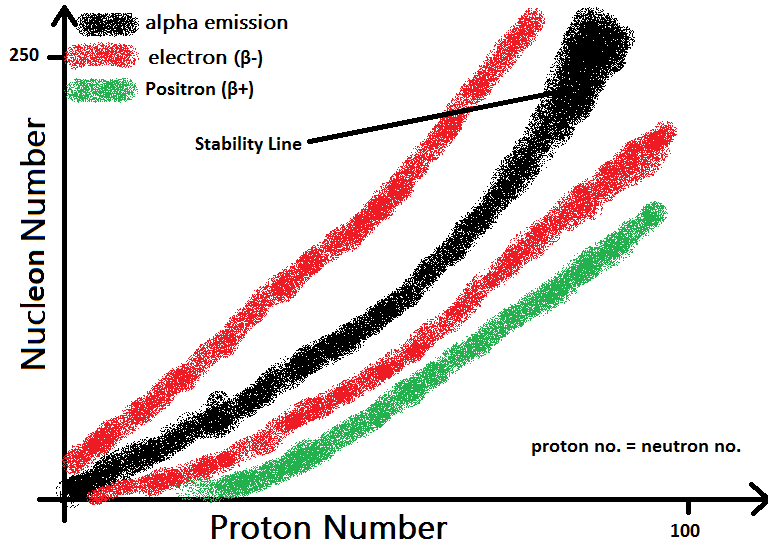 Beta decay, β+ (positron emission) or β- (electron emission), changes the proton number forming a new element. From the graph, you can see that an isotope that doesn’t lie on the black line or stability line will be unstable and radioactive. An isotope that lies above the curve will have too many neutrons to be stable and undergo β- decay. An isotope that lies below the curve will have too few neutrons to be stable and will undergo β+ decay. For all those that are feeling a little confused, this will go over everything about the principals of particles. NOT a fundamental particle as contain three quarks: one ‘up’ quark (+2/3) and two ‘down’ quarks (-1/3 and -1/3) equalling a charge of 0. Too many neutrons in an atom will undergo β- decay (emission of electrons). Can be a type of radiation where neutrons are emitted. In β- decay, a neutron becomes a proton plus an electron. Has a charge of +1. Again NOT fundamental as contains three quarks. This time, it has two ‘up’ quarks and one down quark equalling a total charge of +1. In β+ decay, a proton becomes a neutron plus a positron. Has a charge of -1. Has a mass of 0 but actually is 1/2000 (not important). Is a fundamental particle in normal matter. Is emitted in β- decay. Can be produced in beams with an electron gun such as oscilloscopes. Same weight as a electron at 0 or 1/2000. It is the counterpart or antimatter of an electron. When collided at low energy with an electron, annihilation occurs (scroll down for more info on creation and annihilation). Is emitted through β+ decay. Here is an example of single nuclear fission, which if carried on, will cause a chain reaction. As you can see from the diagram, a neutron will be fired at an atom. The neutron collides with the nucleus of the atom and breaks it into fragments creating LOTS of energy. The fission product or fragments or even daughter nucleus. There is no energy in these fission fragments so they become stationary quite quickly while the other neutrons fly to later collide with another atom’s nucleus. Nuclear fission, the first time it was tested in WWII had two scientists make a bet. One bet that the chain reaction wouldn’t stop and it would go on forever and burn the atmosphere causing everything on earth to burn. Another said it wouldn’t. This just shows how little knowledge they knew and how little they knew of the power nuclear fission holds. Nuclear fusion is the process by which two or more atomic nuclei join together or ‘fuses’ together to form a single heavier nucleus, releasing vast amounts of energy. 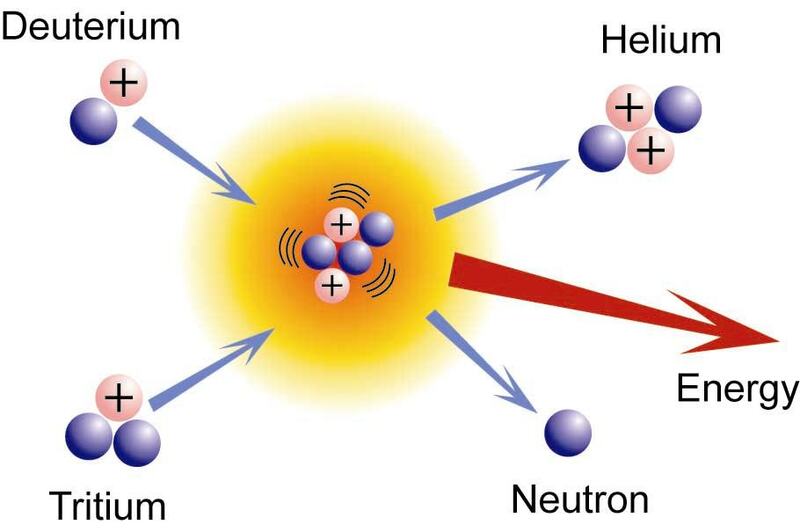 As you can see from the diagram, Deuterium and Tritium ‘fuse’ together to make helium and a neutron. In fusion, some of the mass of the two nuclei added together doesn’t match the mass of the finished product, the finished product is a little less in weight. Because E=mc squared (energy = mass X speed of light squared), the missing mass gets converted into energy releasing HUGE amounts of energy from this reaction. Einstein’s famous equation explains why nuclear decay, fusion and fission are possible as some mass is converted to energy. High energy electromagnetic radiation is needed. Only Gamma rays have enough. A particle and an antiparticle pair must be produced. Conservation of momentum and conservation of charge must be true. Momentum is conserved by the x-ray colliding with an atom. A positron (antiparticle) collides with an electron and the pair annihilates. All their mass is converted back into energy. It is produced in the form of two gamma rays which leave the collision site in opposite directions. Radiation is the emission of energy be it from energy as electromagnetic waves or as moving subatomic particles. As we know, the emission that produces electromagnetic waves is beta emission + or -. Beta – produces electrons while beta + produces positrons. Both types of emission undergo the rearrangement of a nuclei which often also releases gamma radiation. The emission from subatomic (fundamental) particles is alpha emission which produces alpha particles such as helium (4/2). Both alpha and beta emission change the proton number but alpha also changes the mass number too. Gamma radiation doesn’t change either meaning it doesn’t form a new element. Dangers can be grouped into two categories: exposure and contamination. Exposure is when radiation is on living tissue. Contamination is when radioactive substances are taken into the body or attached to substances. So how can we prevent or reduce exposure and contamination in the school laboratory? Radiation does is measured in sieverts (Sv) and a safe daily dose are about 50 Sv which is 50×10 to the power of -6 Sv. That's alright! I'm just someone like you who needs to revise for exams too!